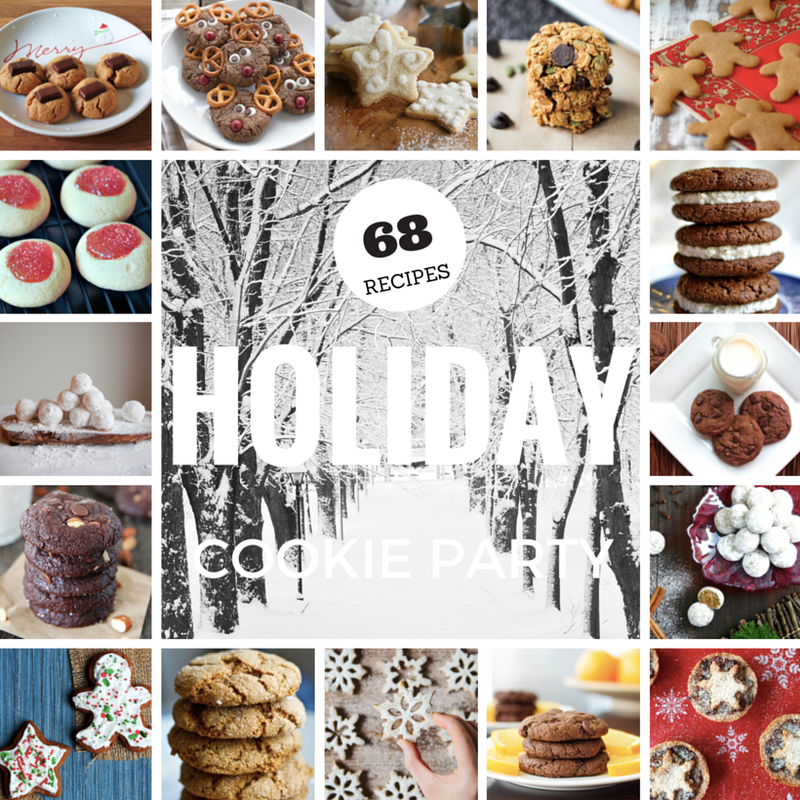 Christmas Cookie Party: 76 Vegan Recipes! Join the party! You do not even need to bring any cookies because clearly, we have enough here already. 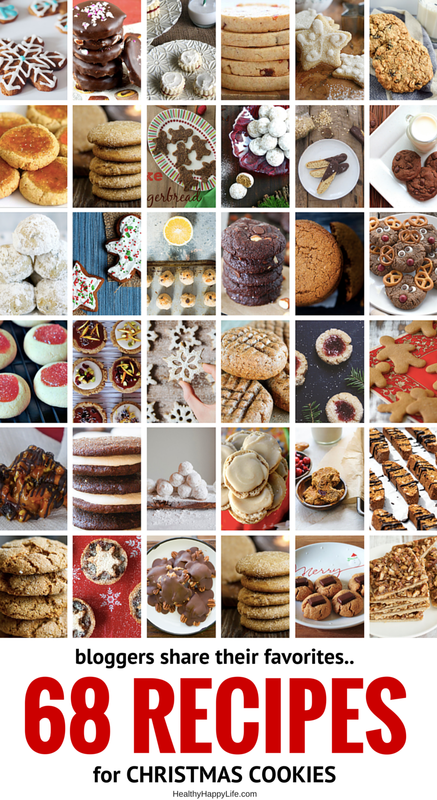 This virtual Christmas Cookie Party features 76 vegan holiday cookies, brought to you by bloggers. 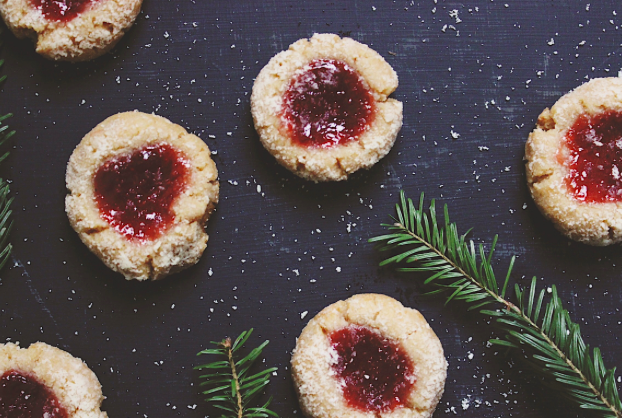 And here is the best part, along with the recipe, each blogger shares why they love these cookies - or a holiday memory about them. 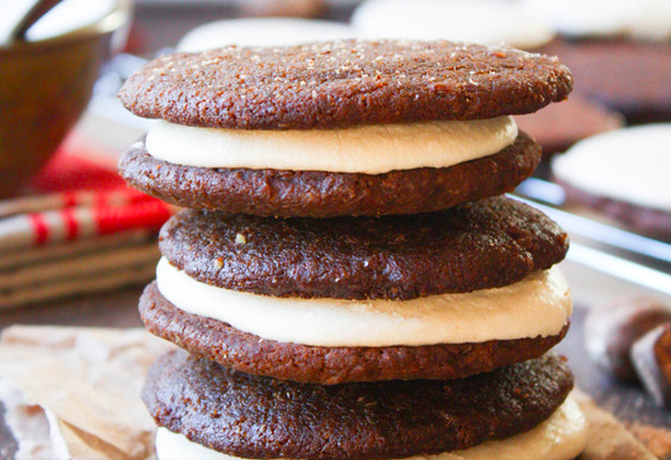 Lets dive into Gingerbread Men, Snowballs, Peanut Butter Blossoms and holiday Sugar Cookies! Setting the Mood. As you hear these stories and recipes from bloggers, imagine twinkly golden holiday lights winding around a staircase. Loads of laughter and warmth the minute you walk in the door. Silver, green and red decorations on a tall pine tree. Warm mugs of hot cocoa set out for you to grab. Ugly Christmas sweaters as far as the eye can see. And out of the corner of your eye a cookie table - that extends for miles. 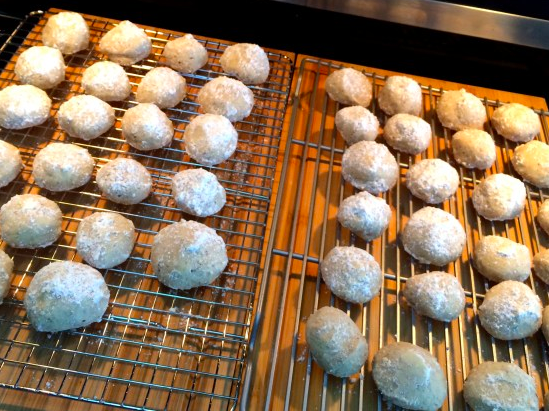 All these cookies lining up for you to gawk at, nibble and take home to enjoy later. 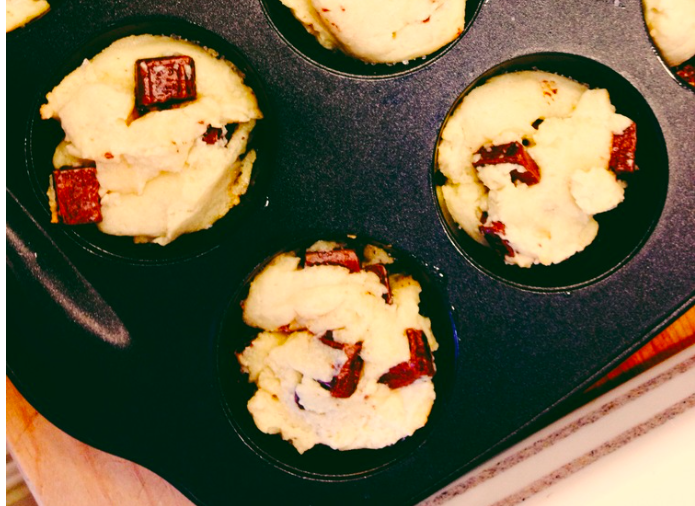 Because every holiday cookie party should come with a to-go container, yes? Let the jingle bell rockin' begin!.. 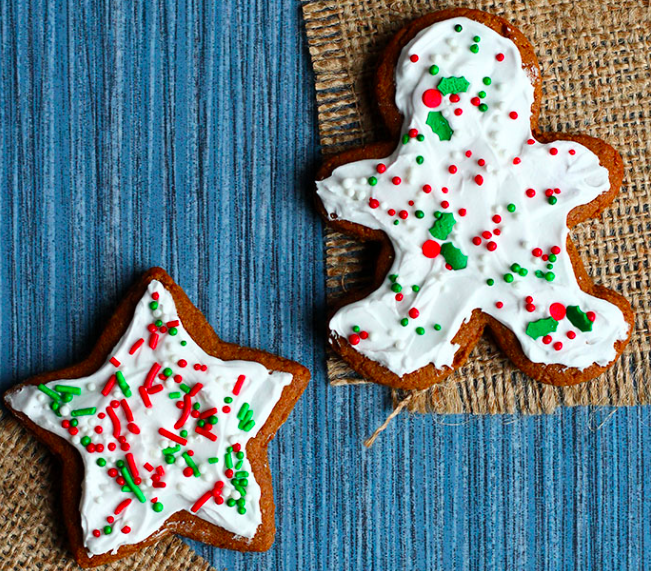 "These bring back memories of making gingerbread cut out cookies with the whole family. 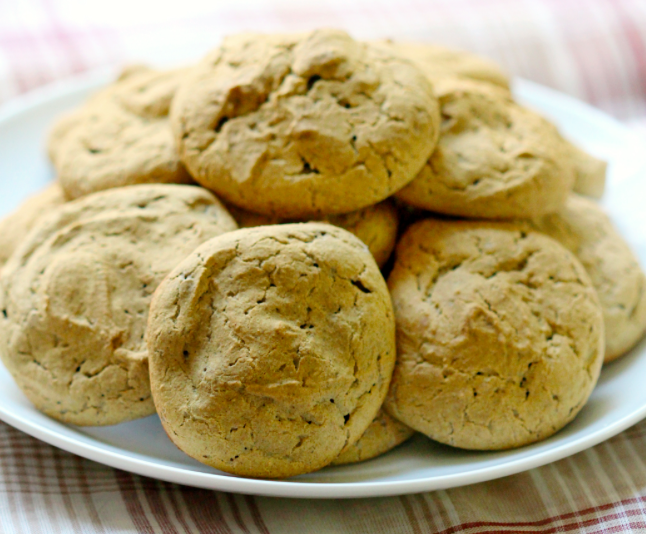 But those cookies were filled with butter so here's a vegan version that's even better! Snowflakes are for the sophisticated!" 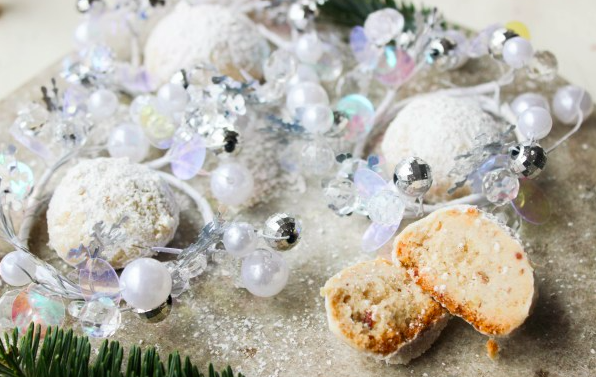 "I love how festive these look, like they've just been dusted by a fresh snowfall!" 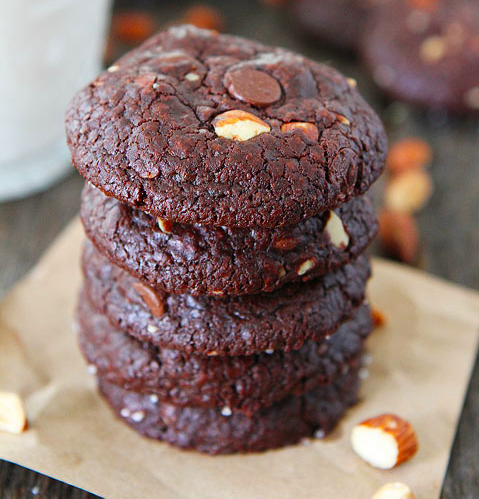 "Rich and fudgy chocolate cookies with chopped almonds and chocolate chips. 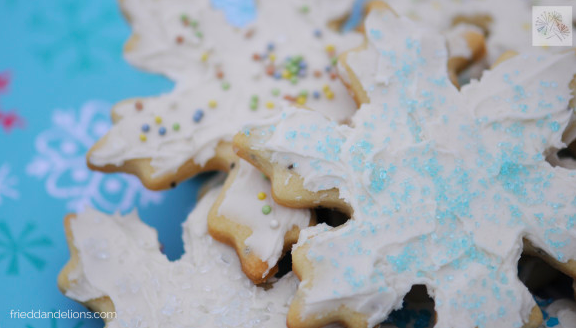 These cookies are perfect for holiday cookie exchanges, parties, and gift giving!" "Orange is one of my favourite Christmas flavours!" "These thumbprints remind me of my childhood, rolling my sleeves up, and blasting Any Grant's Christmas album with my mom and sister, they're everything." 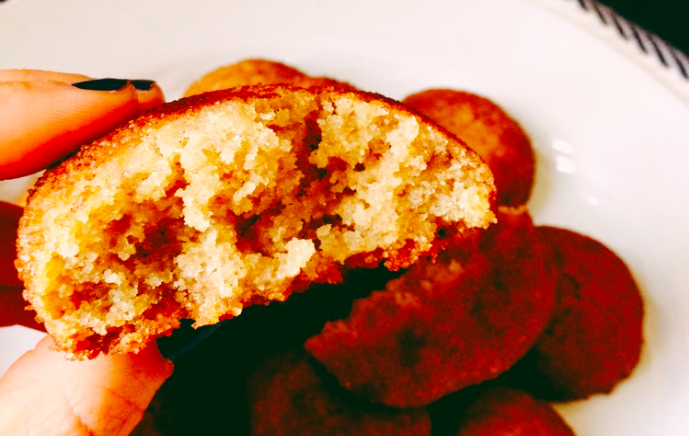 "I love baking with coconut oil. My girls and I had so much fun making these." "These were made by my Great Aunt for many years and I always remember eating them at her house. 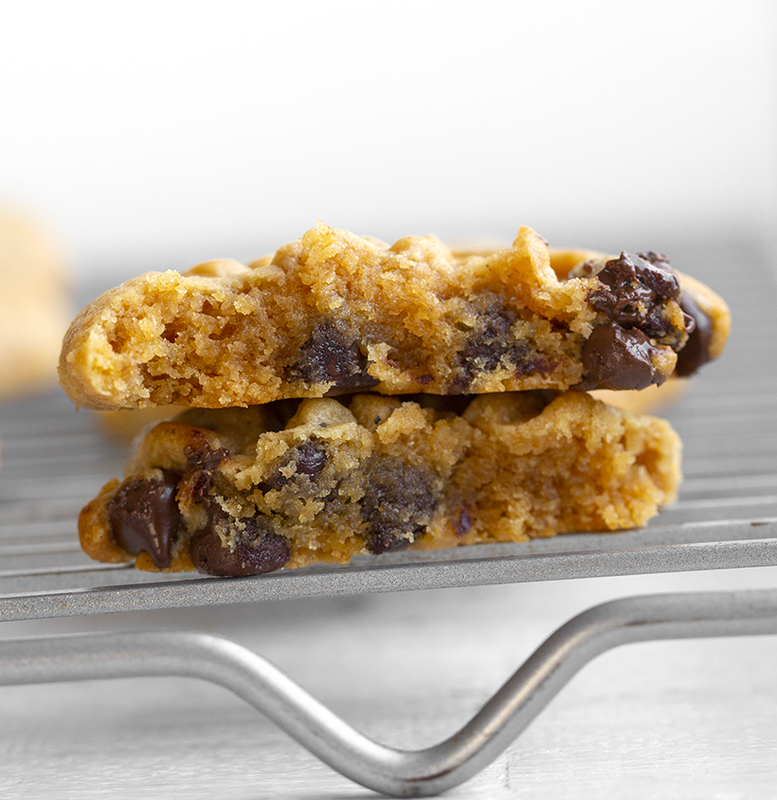 That refreshing peppermint accent makes them a bit more playful than a regular chocolate chip cookie. 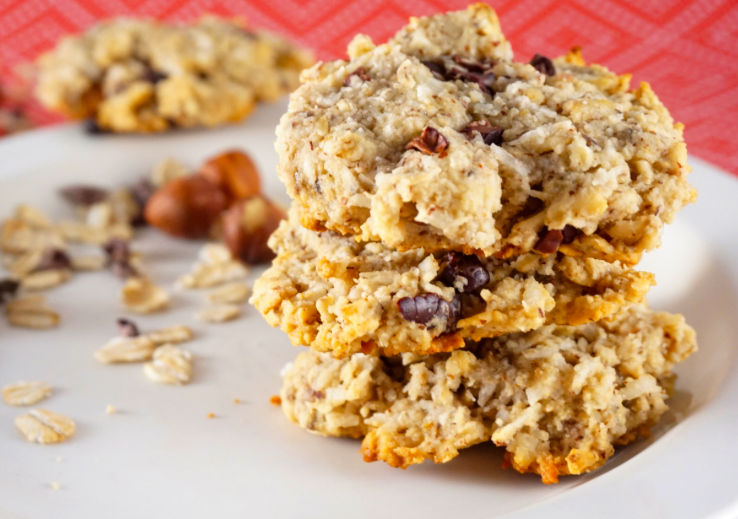 Oat-y, buttery and minty, perfect for a holiday party!" "Vegan kisses are real! 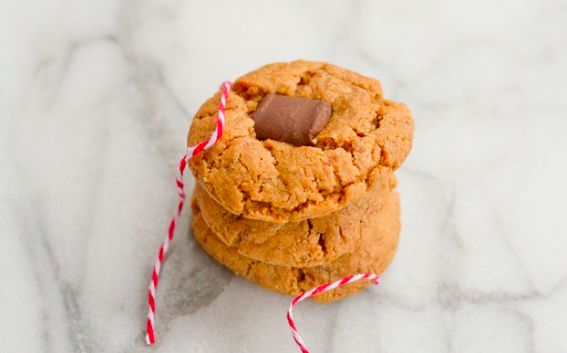 And these just HAD to top these buttery vegan peanut butter cookies to make my fave childhood memories holiday cookie." 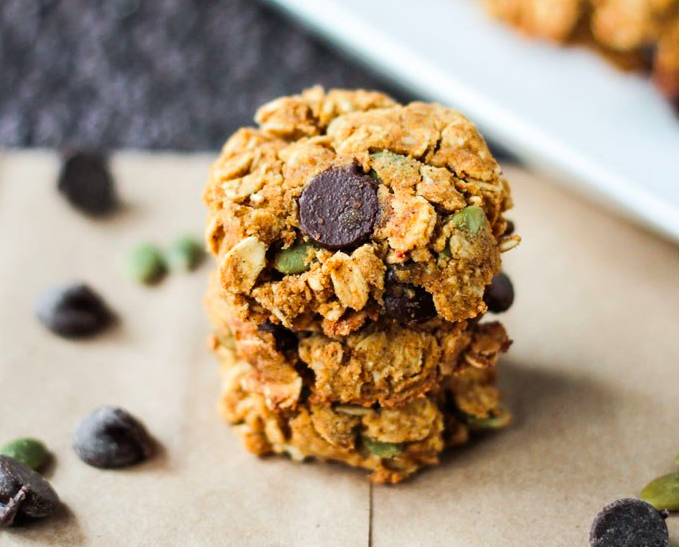 "These crunchy little cookies are super addictive and because they are oil free, gluten free, dairy free and refined sugar free, you can basically eat as many as you want! Happy Holidays!" "My best friend loved sparkly things as much as I do, and was the first to show me the sweet + savory thing. in college, I'd make these for dinner parties." "These pretty cookies make wonderful gifts and are a wholesome alternative to sugary christmas cookies." 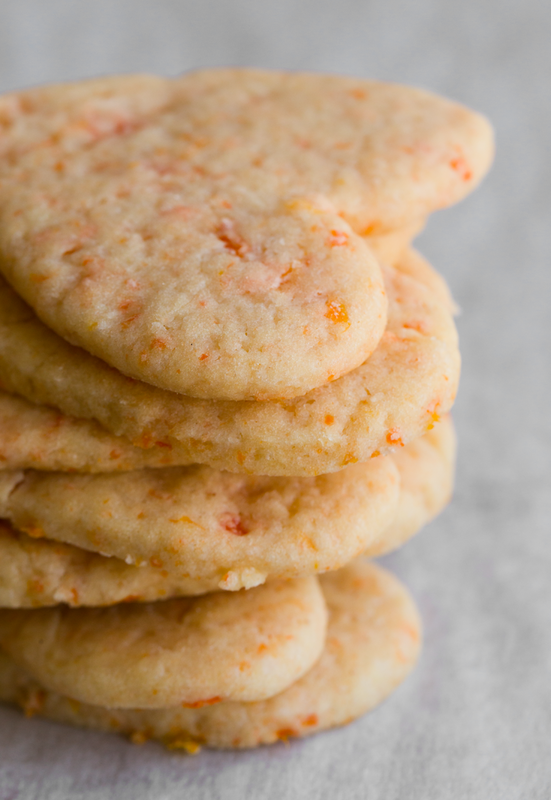 "Delicious soft cocoa and orange cookies are my family favorite all year around. They are so good, that now I have my own product line and the largest organic store in the Baltics are selling these cookies along with my other vegan products. 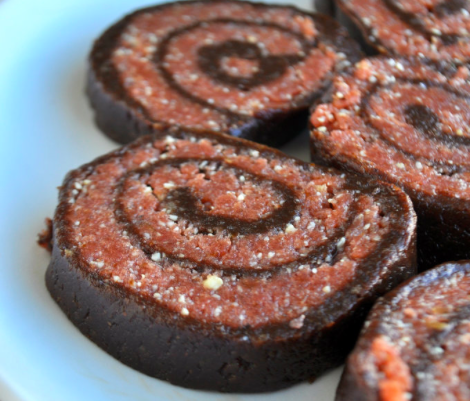 I love that they are soft, like tiny little brownies and infused with fresh orange zest." 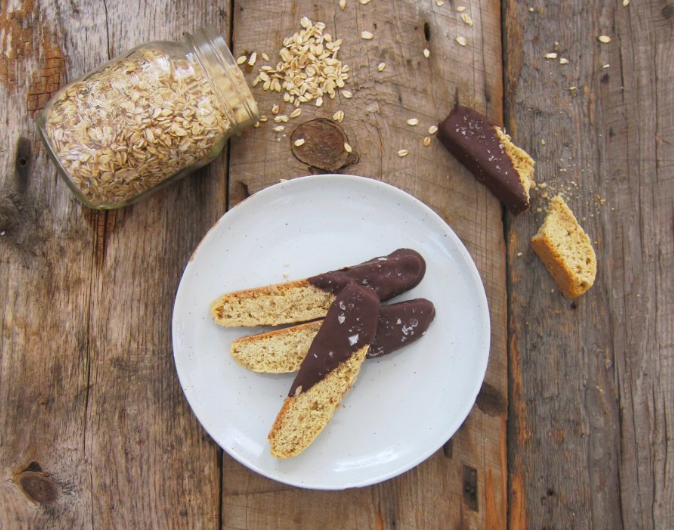 "These biscotti are wonderful because they're dipped in chocolate and sprinkled with sea salt, and they make a beautiful and delicious holiday party hostess gift. Plus they make enough for gifting AND for you to sneak several too!" 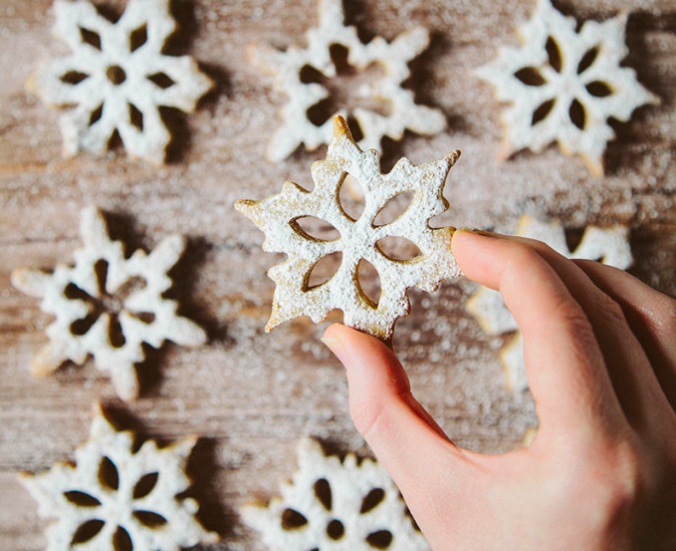 "These guys send me back to my mom baking all our Christmas goodies throughout December, with the kitchen in a constant rotation of delectable cookies, cakes, and bars." 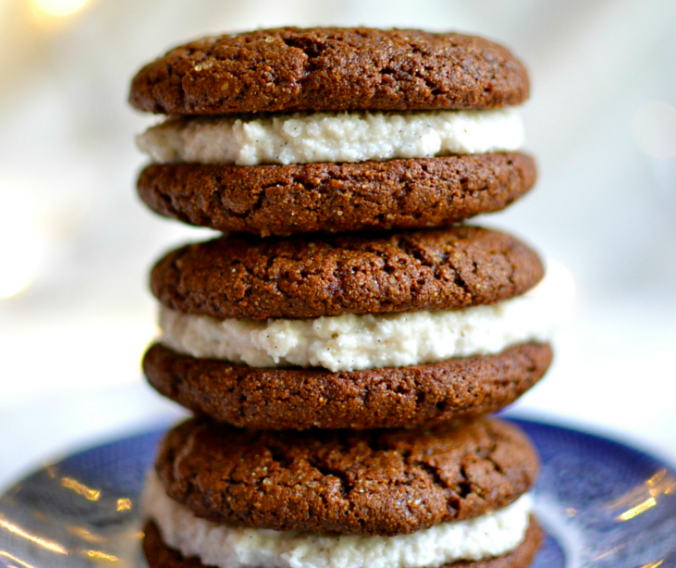 "I love making molasses cookies because it reminds of baking with my grandma! She's the one that taught me all about the wonder that is molasses and all its health benefits!" 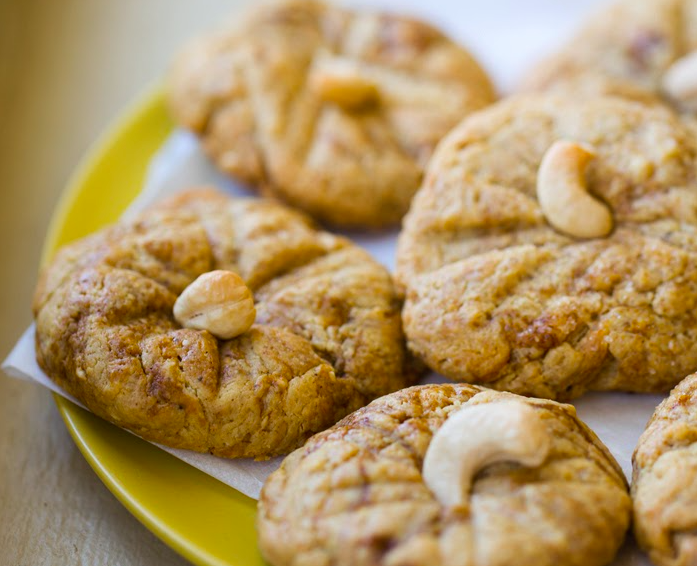 "Everyone loves peanut butter cookies so I tried cashew butter cookies one day. 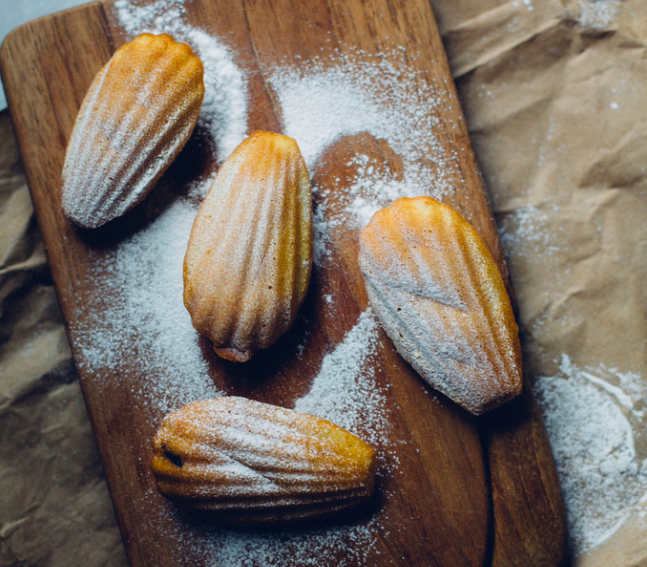 And these are so buttery, chewy and soft. Love the cashew flavor. A real treat for a holiday party!" 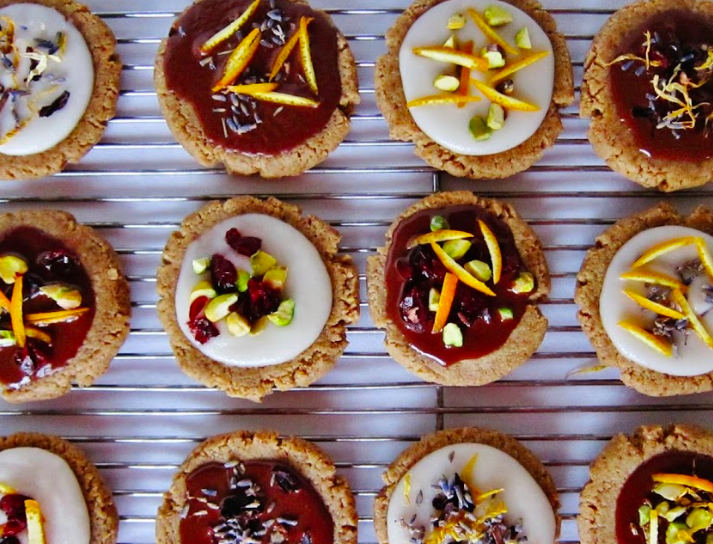 "Perfectly pretty empire cookies that are light, lemony, and now vegan too. Plus you get 2 cookies in one!" 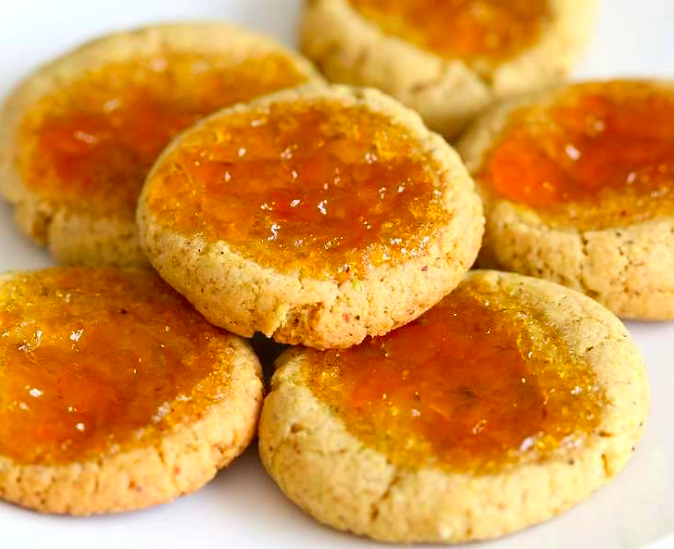 "My Mom had a favorite bakery while growing up and she would always get shortbread type cookies that had candied fruit in them every holiday season. 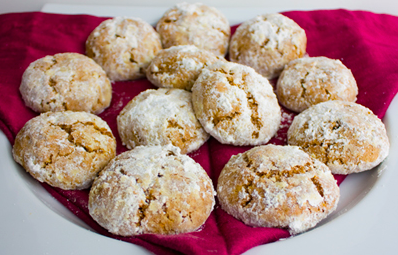 These are my vegan version with candied papaya and pumpkin pie spice." 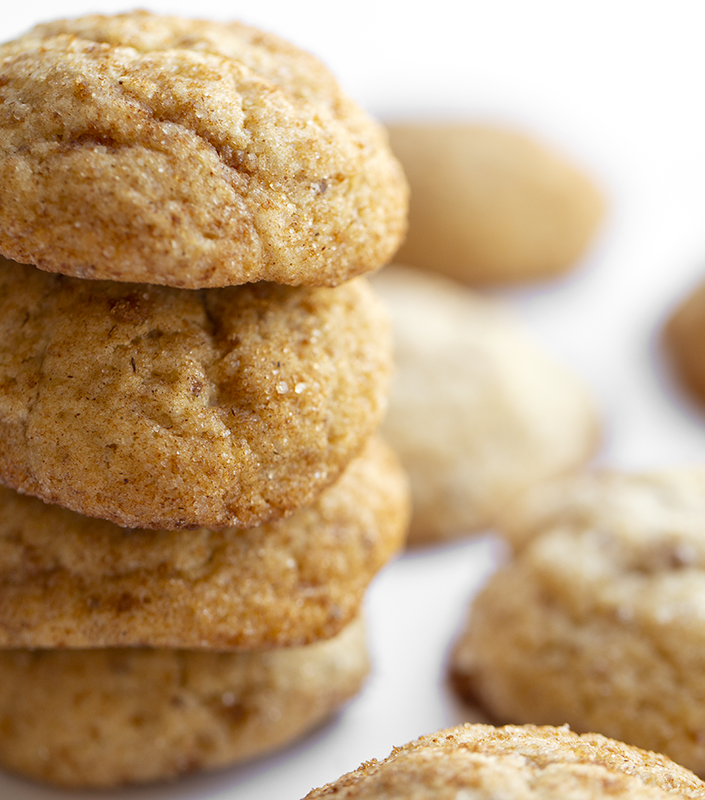 "My great-grandmother kept these cookies – our Great Uncle Wayne’s favorites – in the freezer at all times. 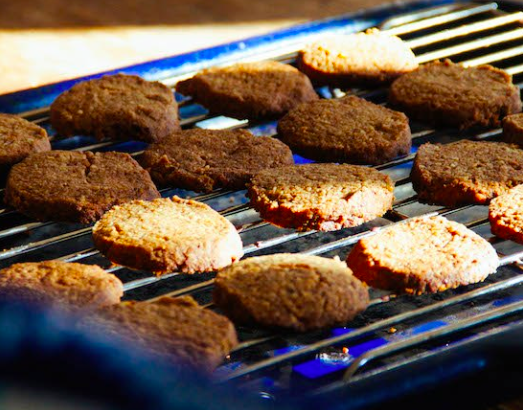 When we would visit (which was constantly, she lived around the block) we would ask, “Can we have Wayne’s cookies?” These are the vegan version!" 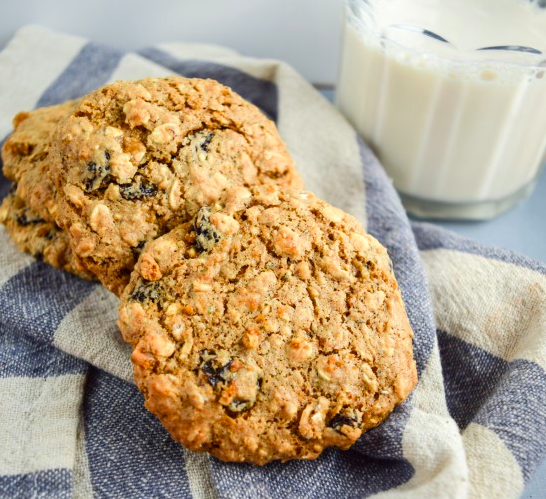 "These are my favorite oatmeal raisin cookies ever! 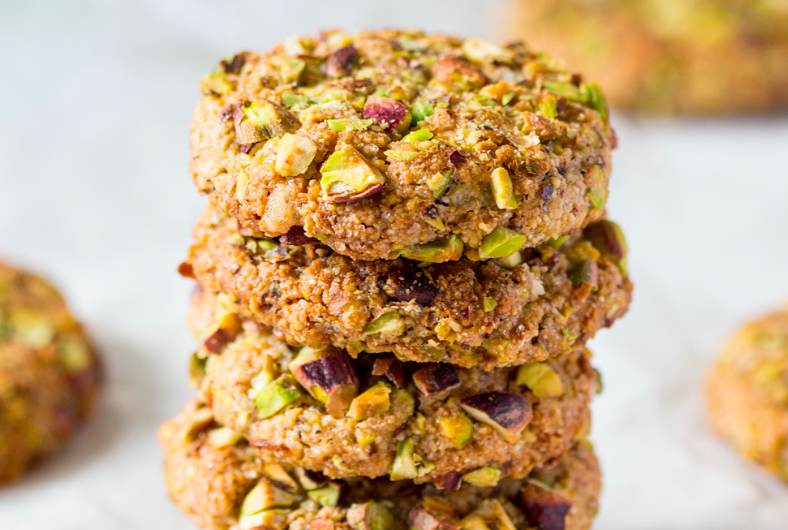 They're made with wholesome ingredients, with delectable flavor coming from toasted walnuts, rolled oats, hemp seeds, and real maple syrup." 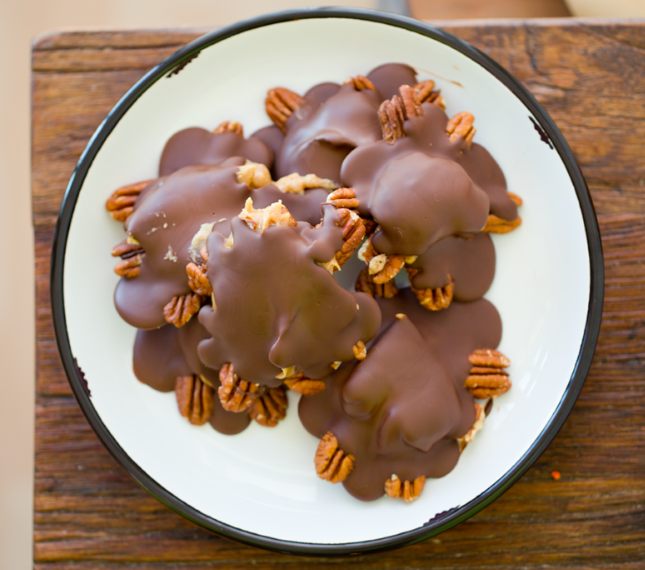 "There is nothing better than a healthy seasonal treat and these are so fun to make with kids!" 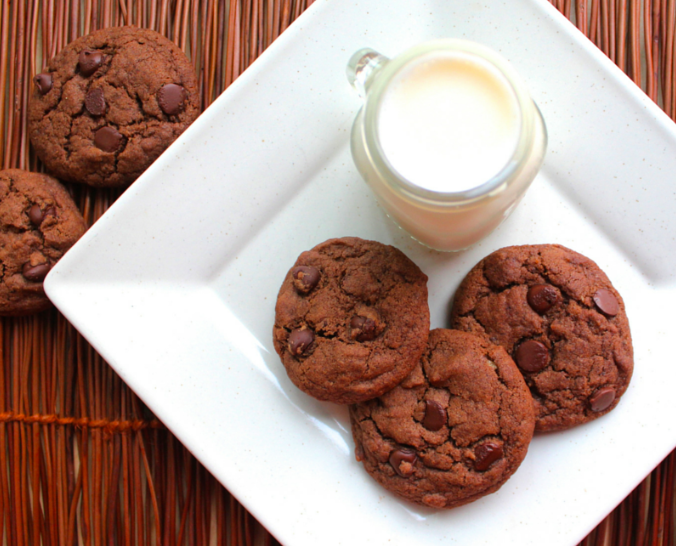 "These cookies were always my favorite in my pre-vegan days! 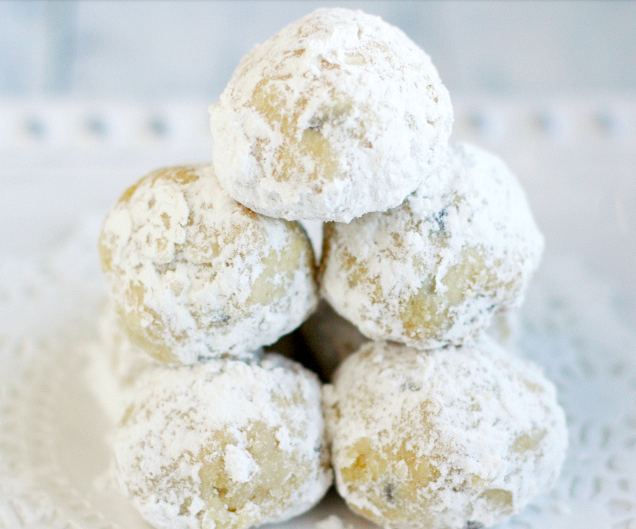 Forget the chocolate chip treats, give me these tropical white chocolate gems! I was SO excited one year when I discovered vegan white chocolate chips. 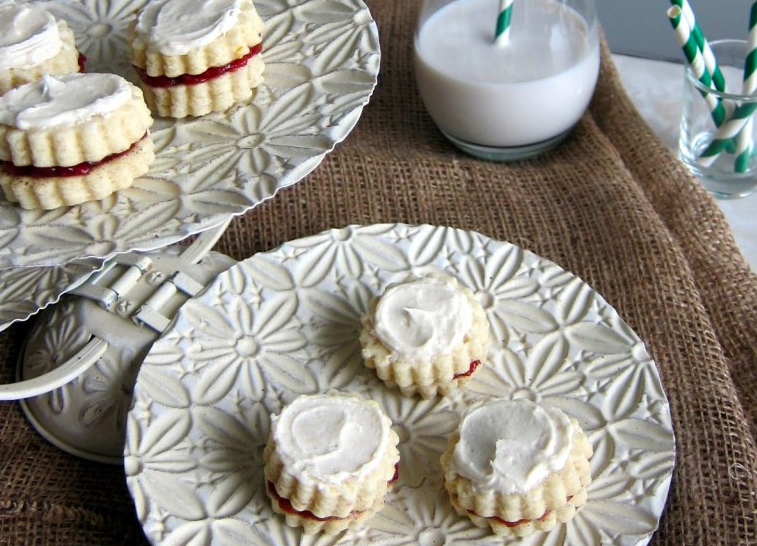 This recipe was the first one on my "white chocolate" list. If you can special order these chips or find them in a store -- make these!" 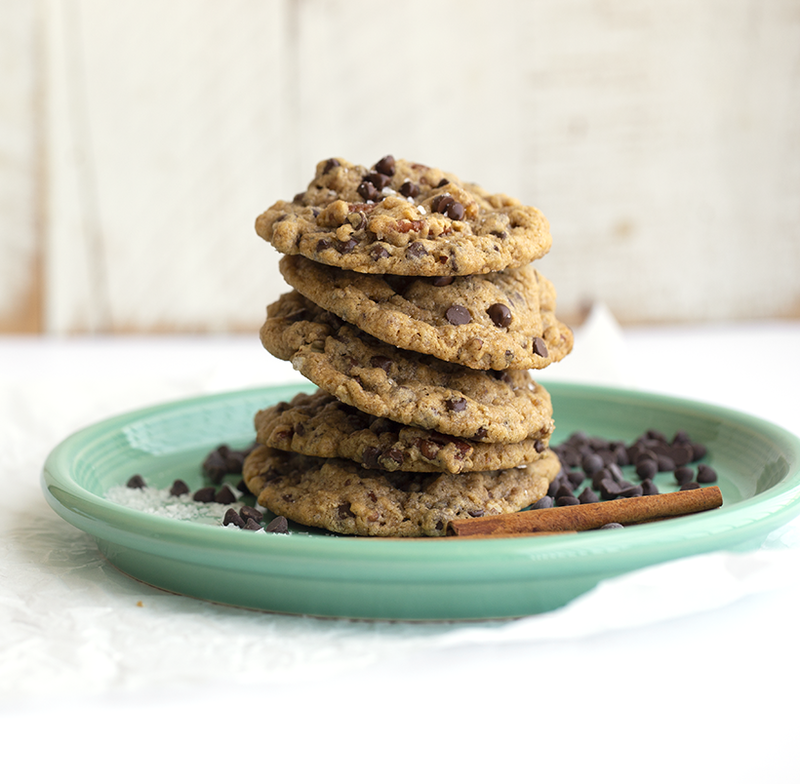 "I love these black pepper & espresso chocolate chip cookies because they are so different then what you are expecting; perfect for adding a little spice to your Christmas Cookie exchange!" 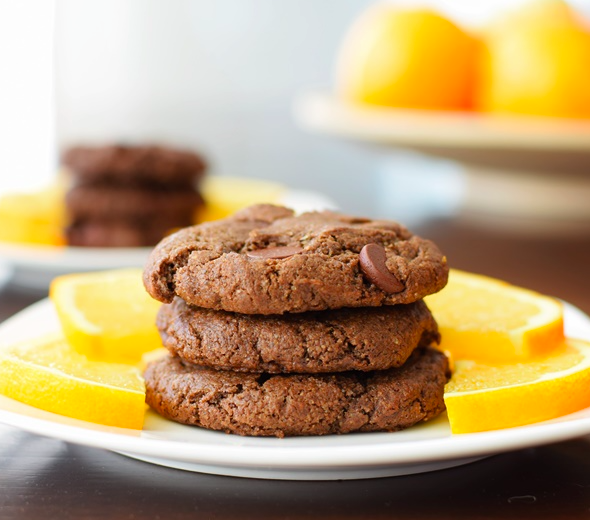 "Double Chocolate Orange Cookies - the base chocolate cookie recipe is one of my favorites as it uses a sneaky, unexpected ingredient. Orange adds a festive, flavorful compliment that we adore." 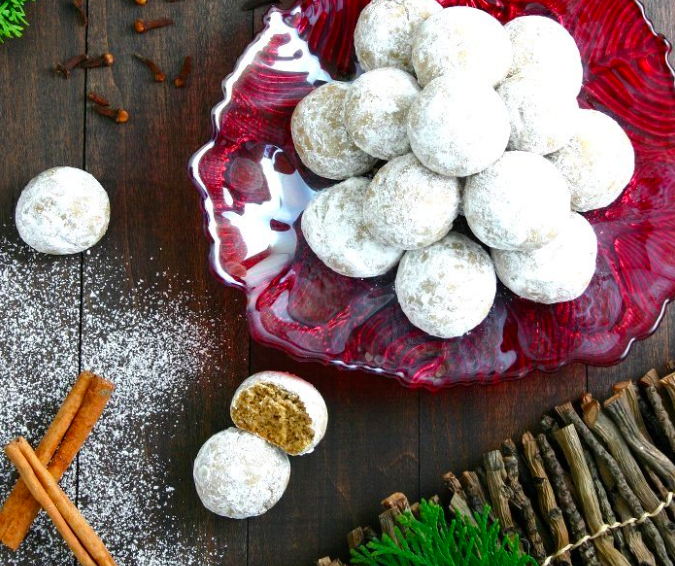 "These cookies take me back to when I was studying in Germany, where I discovered all the sweet and spiced flavors of German Christmastime treats." 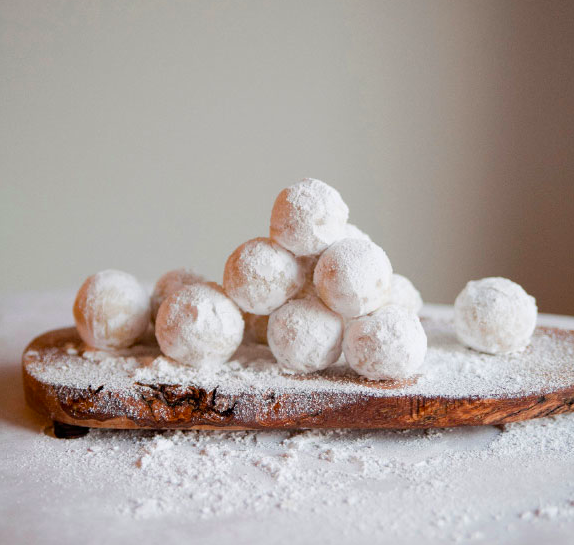 "These Amaretto Snowballs remind me that you can always have fun in the kitchen and in life - just like snowball fights! 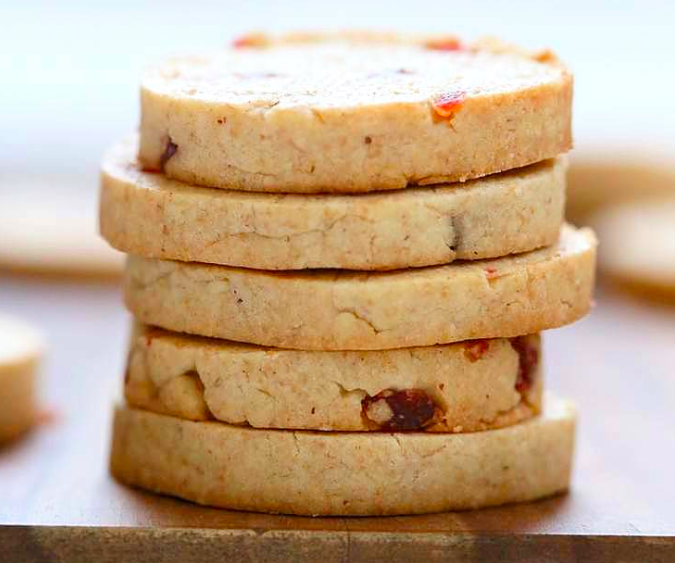 I created these when I first removed dairy and eggs from my diet and it felt so good to bite into something fun that's made with simple clean ingredients that everyone could enjoy too. Best served just after a real snowball fight!!" 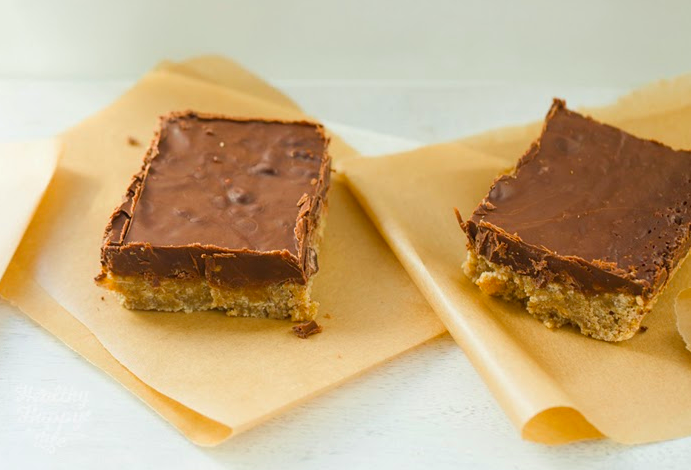 "I used to love finding rich peanut butter bars at holiday parties - and veganizing them was a huge treat for me! 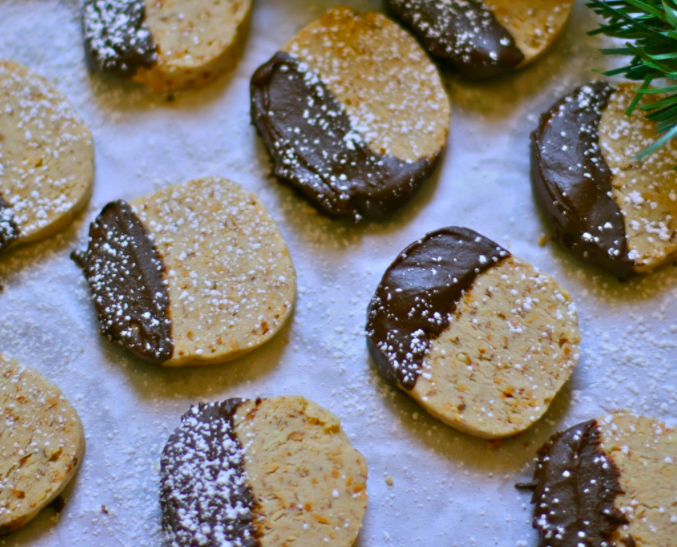 These are a nice departure from lots of traditional cookies at a holiday party. 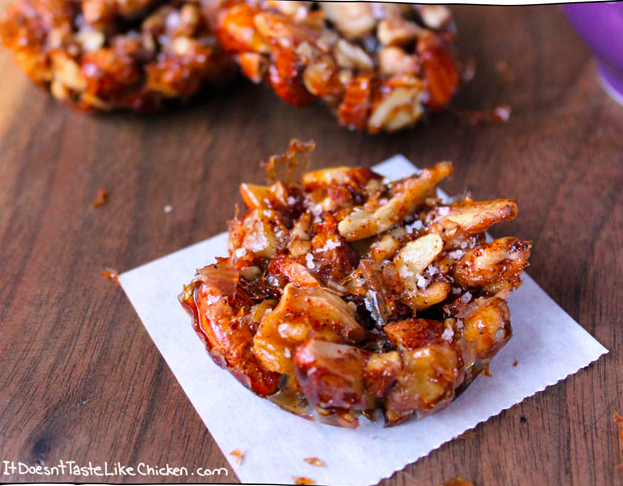 These travel well so your guests can totally take a few for the road to enjoy the next day!" 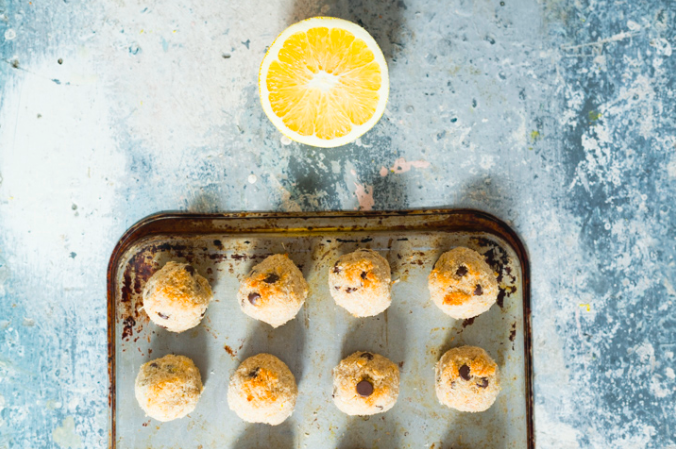 "I love that this recipe is incredibly simple to make and that it is a real crowd pleaser for vegans and non-vegans alike." 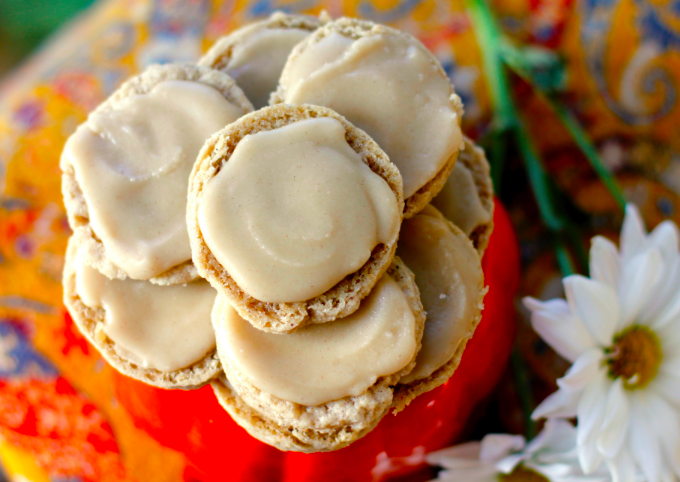 "The flavors of cardamom and orange are just about the coziest flavor combo! When they're being baked and eaten, the smell and taste is reminiscent of sitting by the fireplace with your family and enjoying those previous holiday moments! 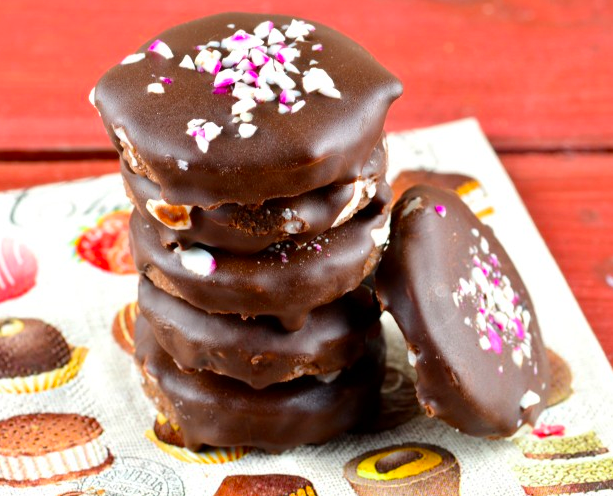 (There are also super easy to make)"
"No one will ever guess that they’re vegan, gluten-free and only require a few ingredients and about 15 minutes to make." 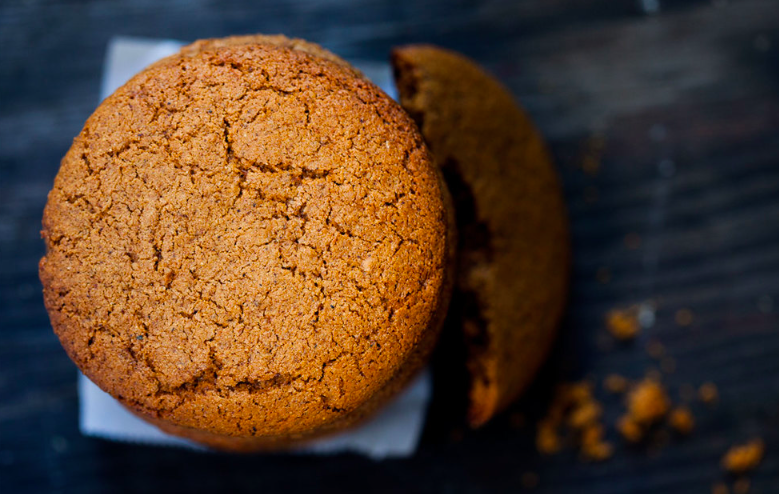 "The ginger in these reminds me of baking cookies around Christmas with my mum and grandma." 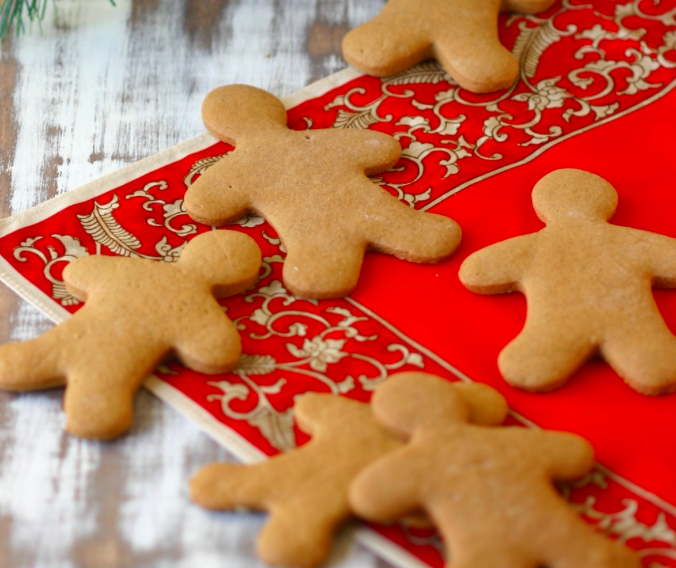 "Looking to make a healthier vegan Christmas cookie, I headed to my mom's homemade family recipe book and adapted these Christmas family favorites to be vegan & gluten-free." 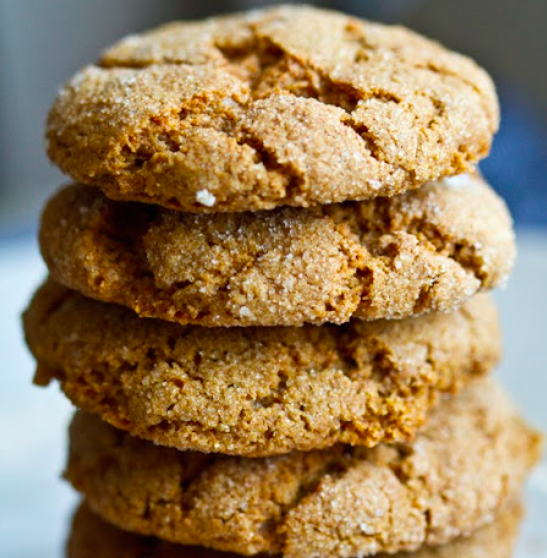 "Soft & Chewy Ginger Cookies! 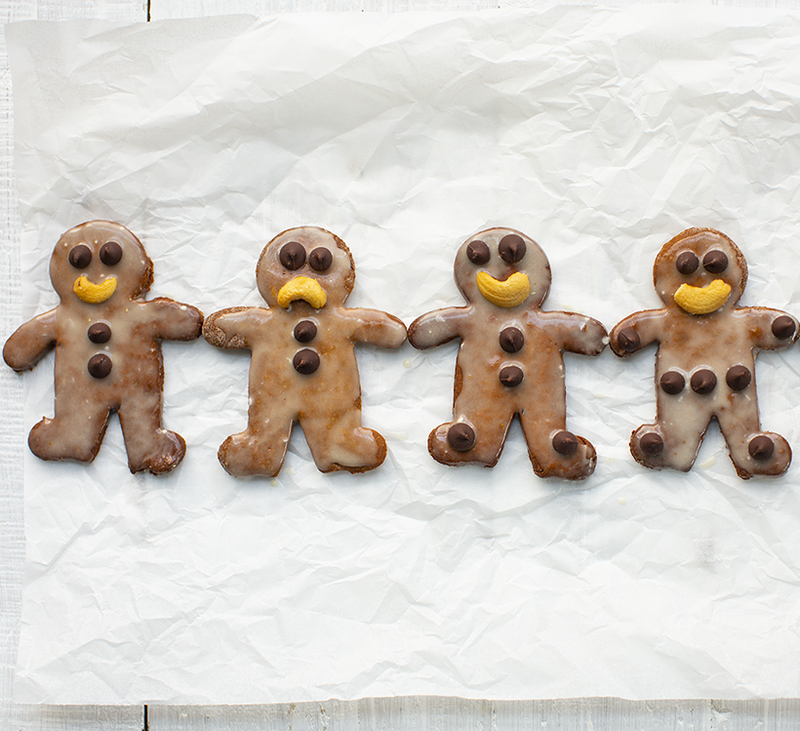 Now that I can't have my childhood favorite soft gingerbread men from my grandparents on Christmas eve, i've improvised!" 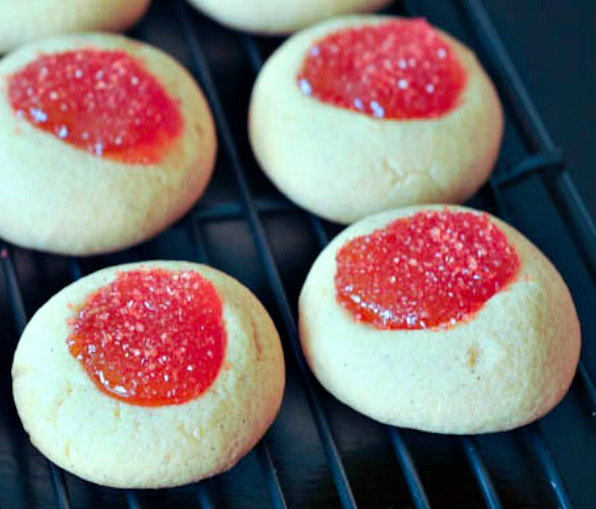 "My brother would do anything to get his hands on the entire package of Jam thumbprints. He was the happiest around Christmas." 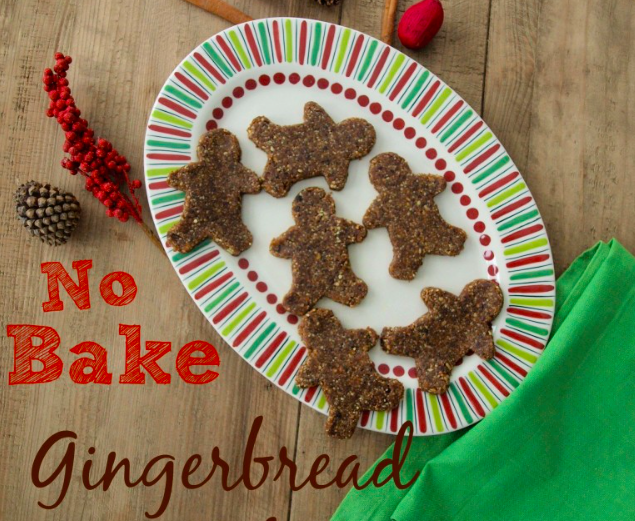 "I made a healthier no bake version of one of my favorite holiday cookies originally made with white flour and sugar." 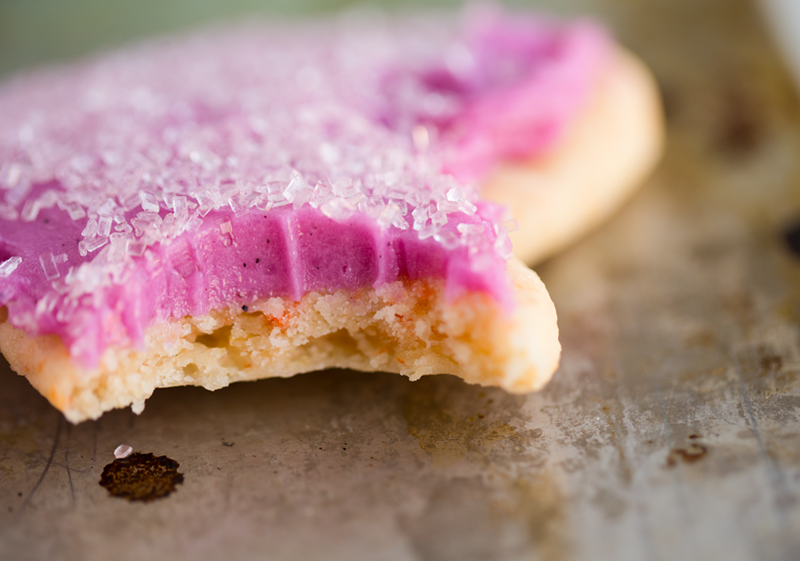 "Raw Glazed Sugar Cookies, my raw and vegan version of the sugar cookies my Grandma used to make that I loved as a child. They were always my favorite." "My mom sent me a box of these cookies every year while I was away at college! 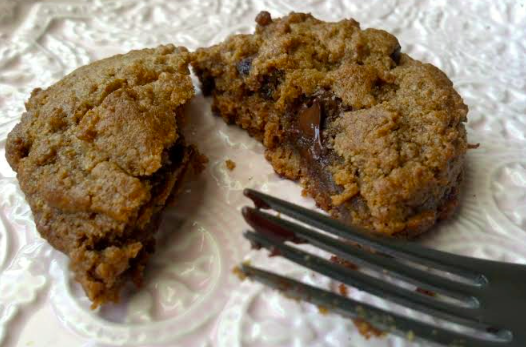 I loved how after a few days of shipping the frosting melded into the cookies for a perfect bite!" 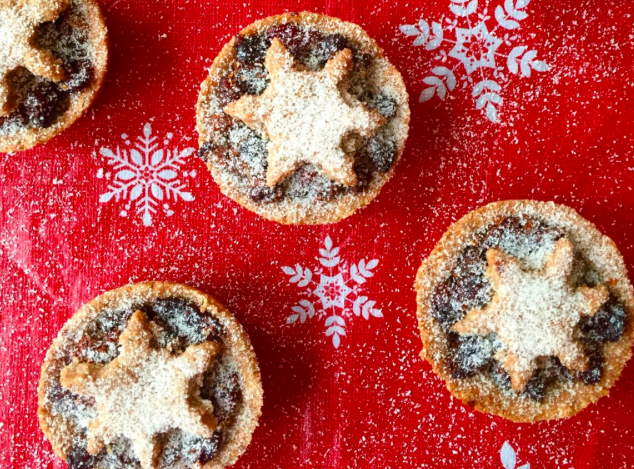 "Mince pies are the typical British Christmas treat, but it is not vegan, so I had to "veganise" to make sure the whole family can enjoy it and have guilt free vegan Christmas!" 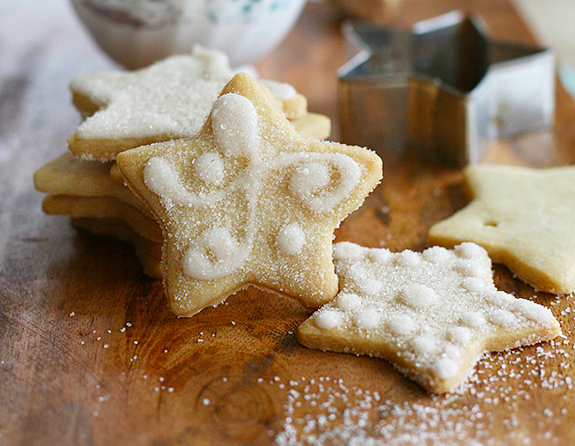 "Not exactly a cookie, but these were always my grandpa's favorite treat to nibble around the holidays. We always had turtles on hand. So I was thrilled to veganize them!" 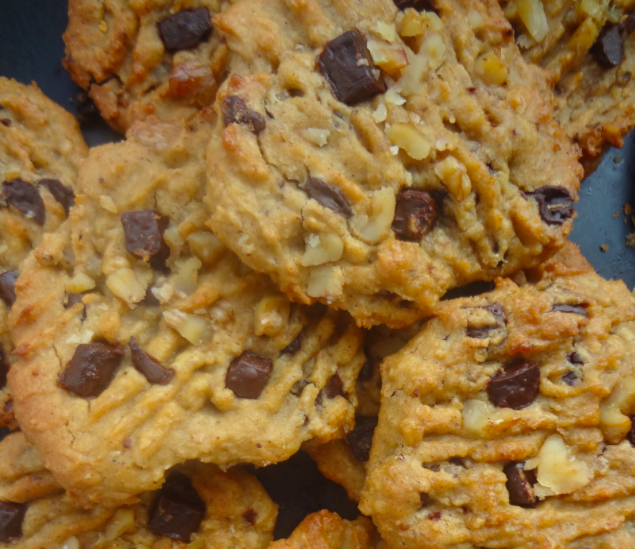 "This is my favorite cookie recipe because I created it before I became vegan, and updated the recipe to remove butter/eggs from it a few months ago. My friends and family love it even more & they barely remember its vegan! smile emoticon they're thick and hearty, chocolatey and sea-salty, and, best of all, Christmas-y!" 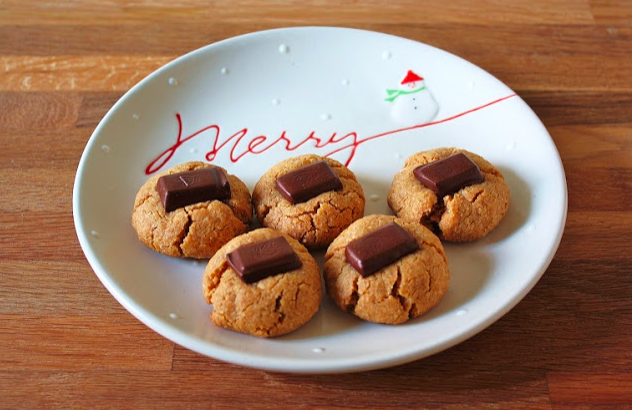 "One of the first holiday cookies I posted to my blog! I was so excited about my creation of these cookies and I still make them today for a taste of nostalgia." 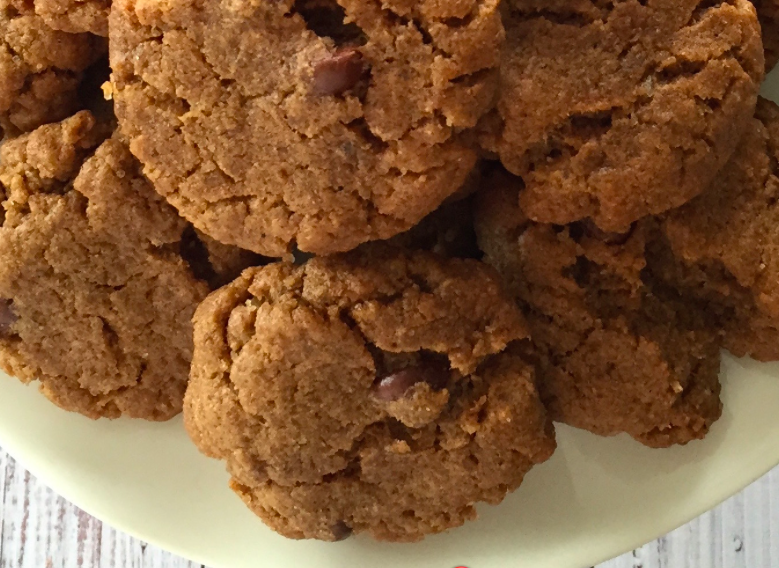 "This is my new (as of this year) favourite holiday cookie recipe! 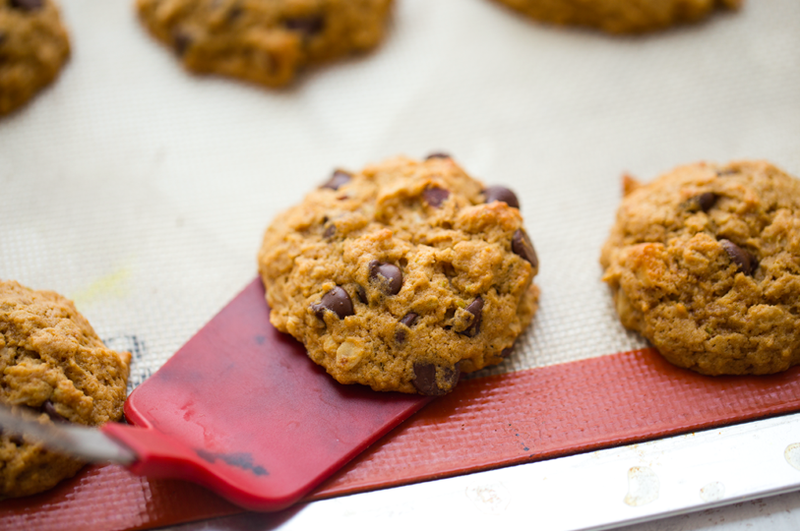 Peanut Butter Chocolate Chunk Cookies. 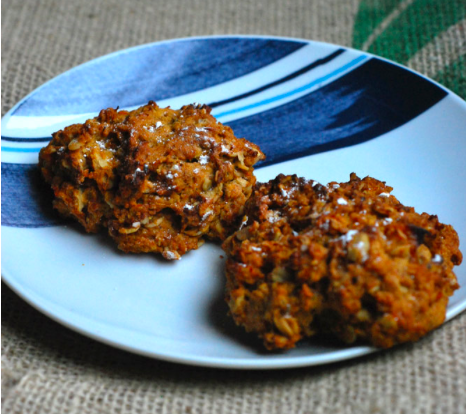 I love them because they can be made in under 10 minutes and they're secretly healthy and full of protein! 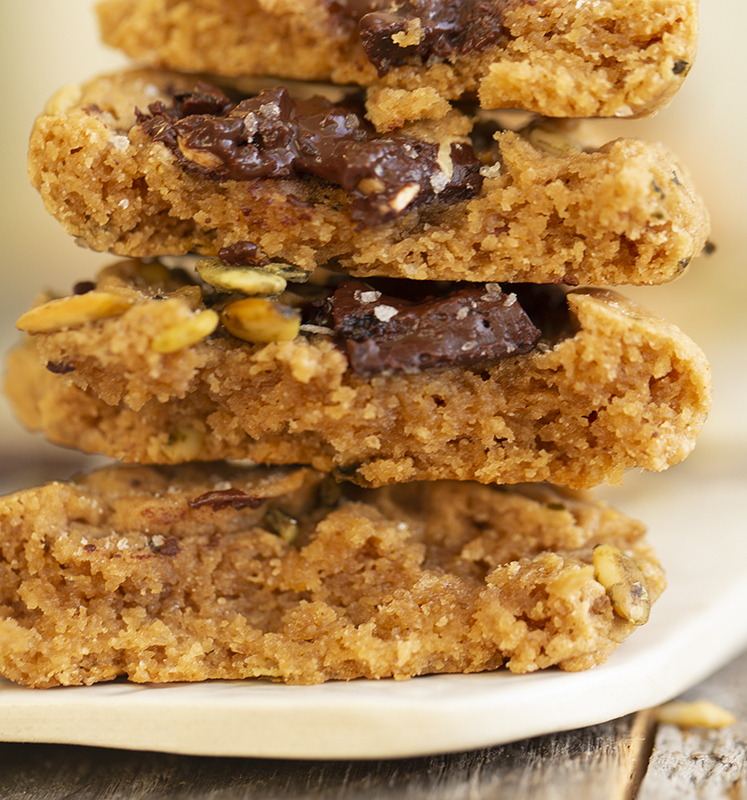 So you can eat them all holiday season without so much christmas-cookie-binge guilt!" 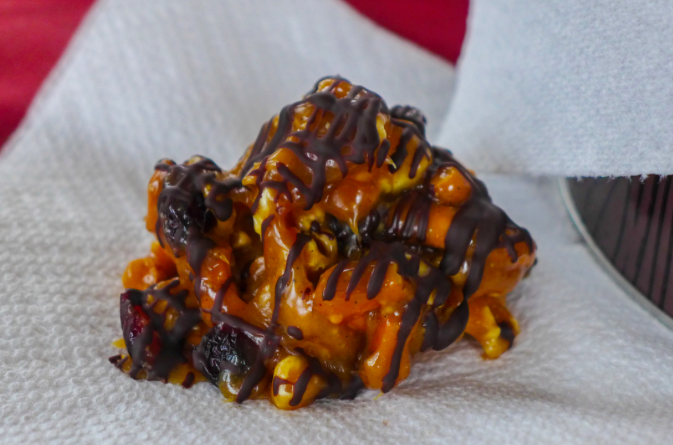 "These "Reindeer Treats" are my gluten-free, vegan and more healthful updated take on a popcorn ball or rice crispy treat, which I would consume lots of around Christmas when I was a kid. We would have these around because my mom was always an on-and-off gluten-free eater. 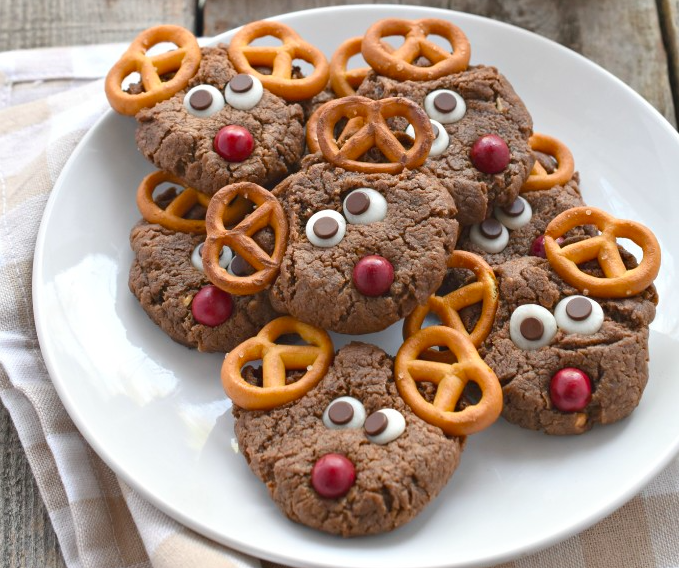 These are a great treat to make for those who need a last minute cookie to take to a gathering because they're no-bake and they set up quite quickly! Happy Holidays, all!" "The holidays are the time that bring out the kid in everyone, especially me. 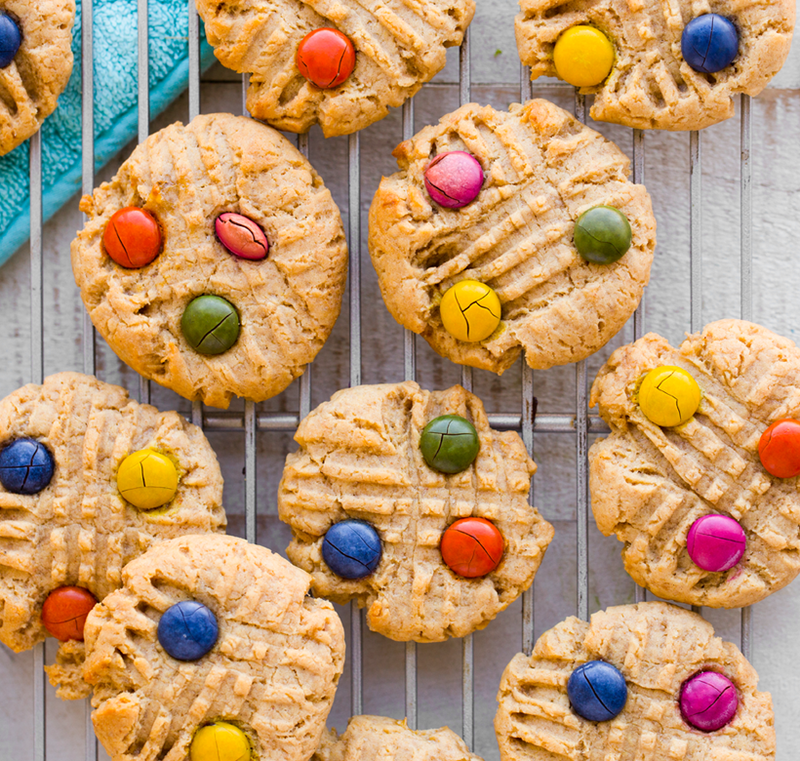 I love these cookies because they remind me that having food allergies can still be fun and creative!" 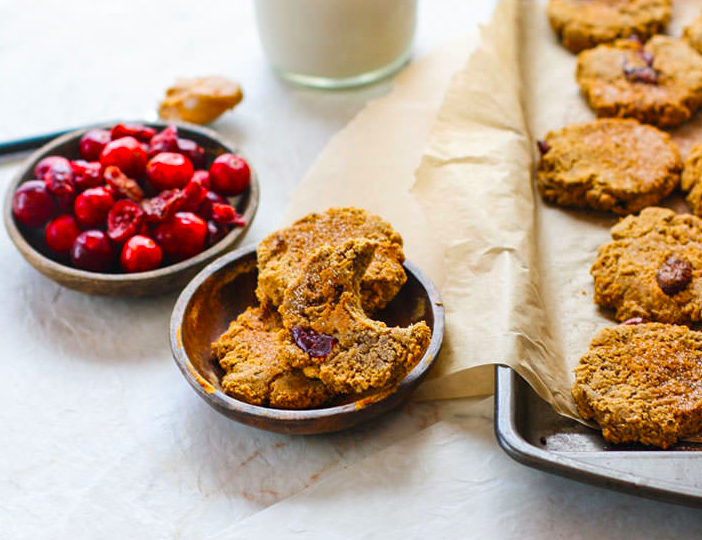 "This cookie is a veganized version of a classic cookie i enjoyed as a child at my family friend's annual christmas eve party." 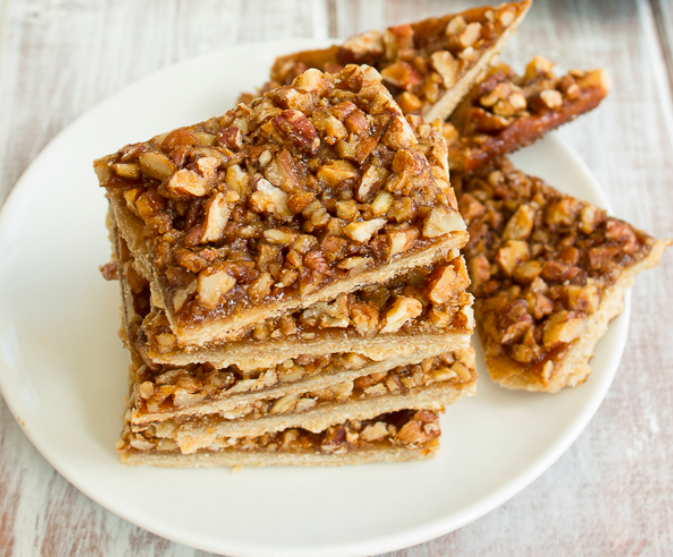 "This recipe took me FOREVER to perfect, and my family and friends cannot get enough of these! And they're amazed that I don't use any eggs or butter." 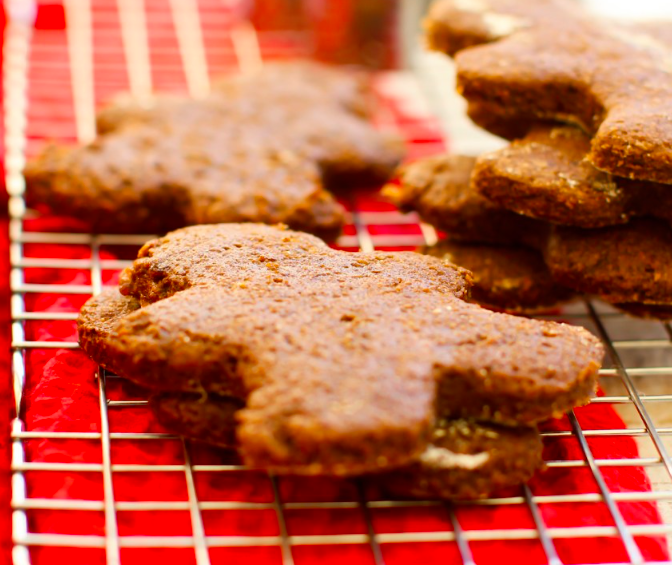 "Gingerbread cookies should be gingery! 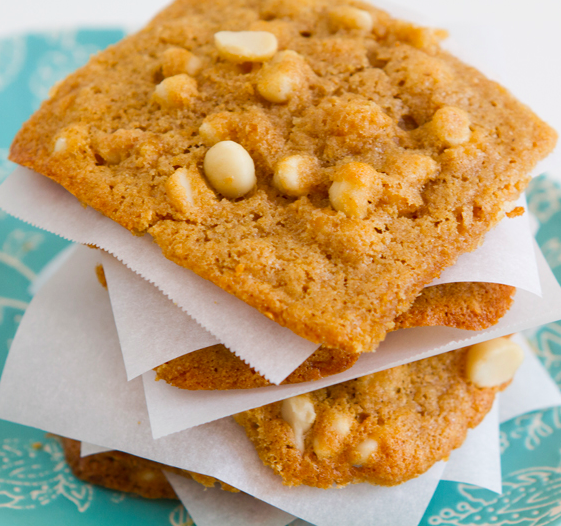 That's why I like this recipe; it includes both dried and fresh ginger." 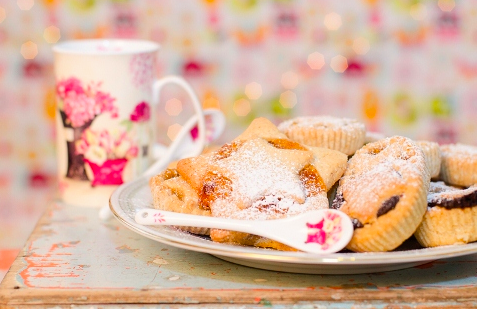 "Mushrooms are a Polish Xmas staple and these baked dumplings/hand-pies are delicious, especially with a mug of hot barszcz (aromatic beetroot broth)." "Nothing screams holidays like a nice peppermint and chocolate cookie." 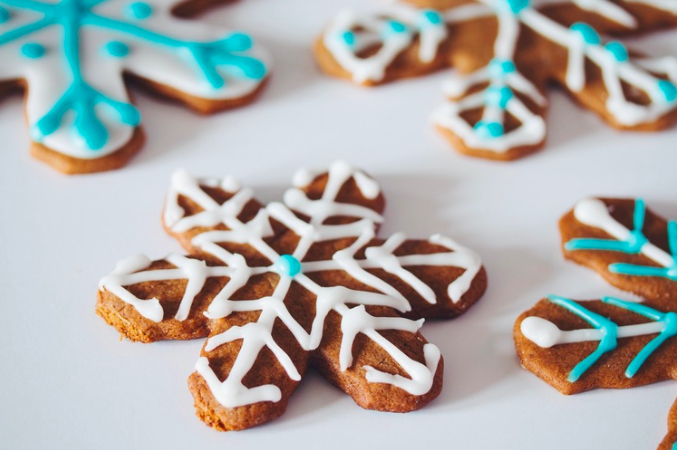 "I love these because they only take 5 ingredients and 10 minutes to make, making them the perfect last minute cookie for holiday company!" 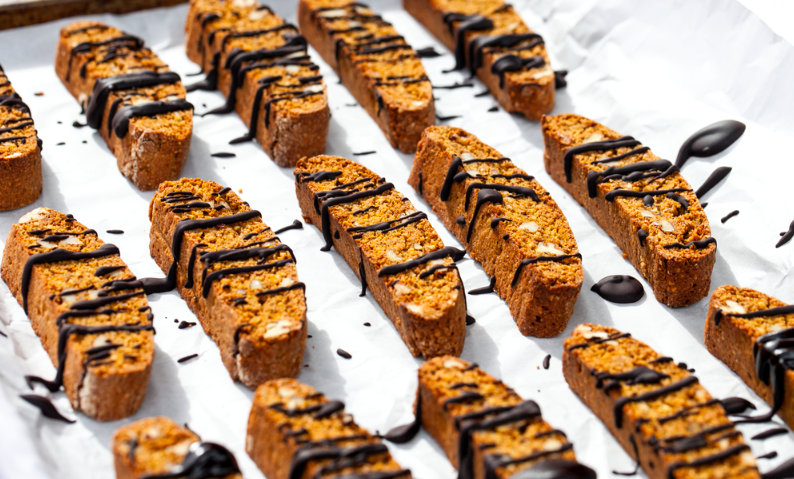 "Biscotti is my family's favorite type of cookie since we are italian. My 90 year old grandmother still makes biscotti for Christmas and they are unbelievable! 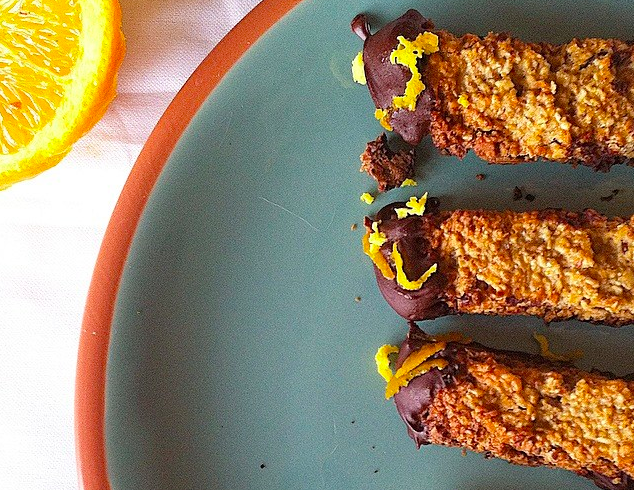 These Dark Chocolate Orange Biscotti are an ode to her." 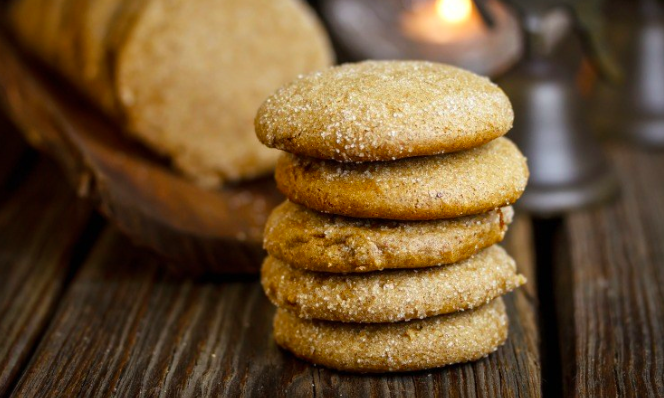 "Soft and chewy gingersnaps embody the warm flavours of Christmas: molasses, cinnamon, cloves, nutmeg, ginger... And family members that arent a fan of chocolatey or super sweet desserts will appreciate this option." 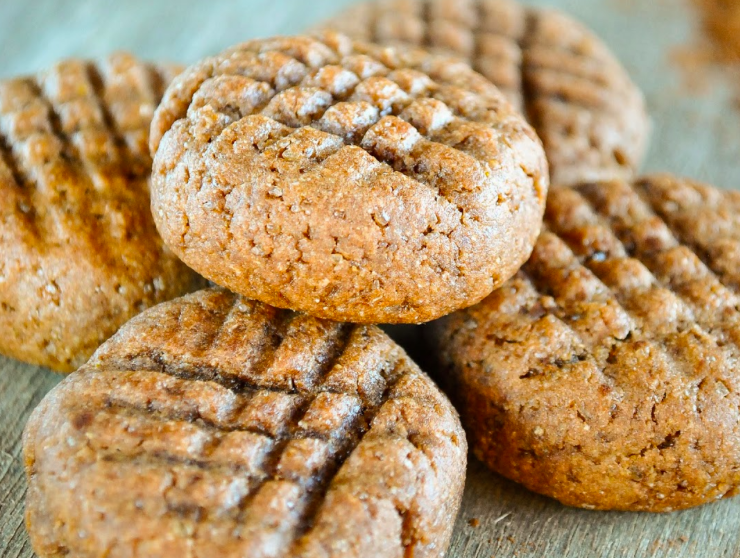 "These ginger cookies have a hint of peanut butter in each bite." 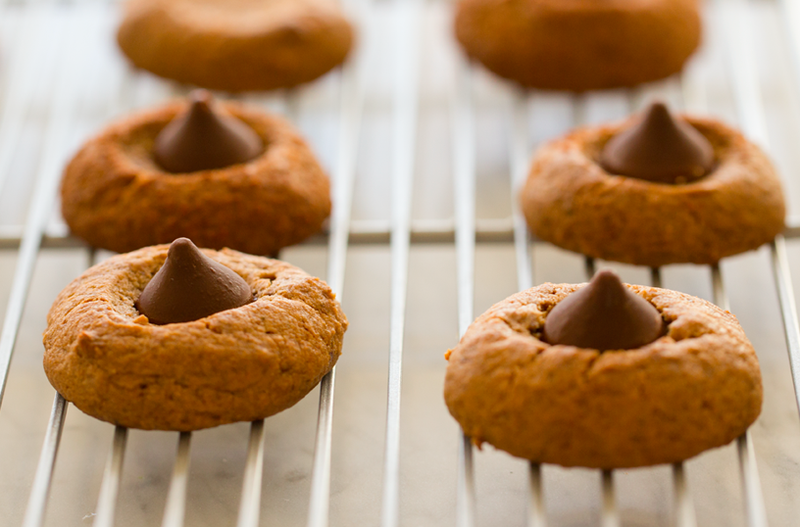 "I grew up making peanut butter blossoms with my mom every year at Christmas, so it is fun to be able to make a healthier, vegan version!" 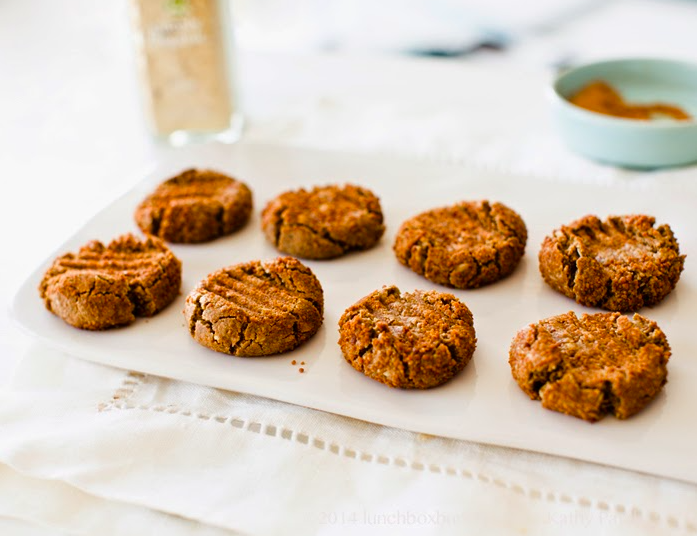 "These chewy, dark caramel colored ginger cookies are spicy and warming and perfect for creating a festive mood!" Oh, and I did a BUZZFEED post for this! 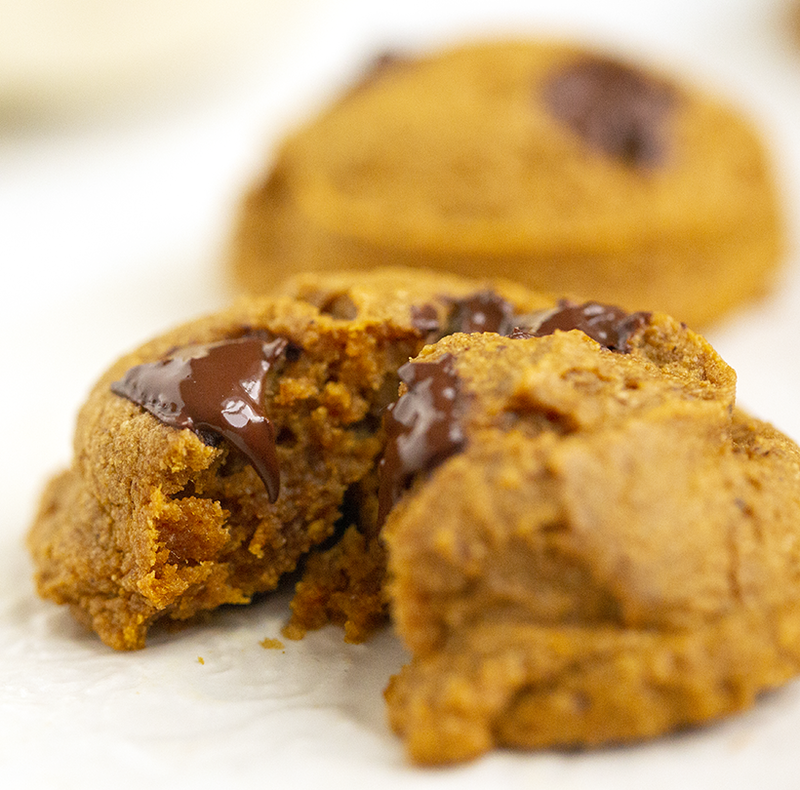 Check it out and share to spread festive cookie goodness.